Kingston museums and art galleries are pleased to present two dates with extended evening opening hours this summer. “Museums at Night” has long been a popular event in many European countries and now, Kingston visitors and residents can experience their own heritage and culture institutions in the evening from 5-8pm on Thursday July 9th and Thursday August 6th 2015. As an added bonus, Kingston Trolley Tours will be offering extended operating hours on these evenings. Leave the car at home, and enjoy a relaxing evening touring beautiful Kingston and visiting many of its museums and art galleries with friends and family. 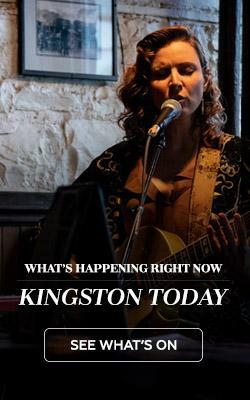 This event is being organized by the Kingston Association of Museums, Art Galleries, and Historic Sites, in partnership with Kingston Trolley Tours. Established in 1977 as the Kingston Artists’ Association Inc. (KAAI), Modern Fuel Artist-Run Centre is a non-profit organization facilitating the presentation, interpretation, and production of contemporary visual, time-based and interdisciplinary arts. Modern Fuel aims to meet the professional development needs of emerging and mid-career local, national and international artists, from diverse cultural communities, through exhibition, discussion, and mentorship opportunities. Features exhibitions from Queen’s Fine Art students as well as professional artists. Built in 1846 as part of the defensive Martello tower fortifications of Kingston, this museum has 3 floors displaying a collection of military and domestic artifacts of 19th-century. King Street West at Barrie St. Explore this fascinating museum and National Historic Site, or take a guided tour, to learn about the history of health and heath care in Canada. Education programs available. Visit the 1840’s restored house and gardens of Sir John A. Macdonald, Canada’s first Prime Minister. Exhibits in the visitor centre commemorate his life and career, and costumed staff present the daily life of the Macdonald family. Established in 1961, the current RMCC Museum occupies space in the Fort Frederick Martello Tower (ca 1846), with modern environmental storage and work spaces elsewhere. Additional displays are mounted throughout the College buildings, and on Point Frederick where National Historic Site plaques describe the Naval Yard, the Point Frederick Buildings and the Kingston Fortifications, now part of the UNESCO Rideau System World Heritage Site. Built in 1873 as the Kingston Penitentiary Warden’s residence, “Cedarhedge” now houses Canada’s Penitentiary Museum. Investigate the history of Canada’s federal penitentiaries. It’s time well spent! Visit a one-room school classroom of the 1890-1910 era. View displays of artifacts, schoolbooks, equipment and photographs. Experience social and school life as children did in pioneer days. The Pump House Steam Museum is located in one of Canada’s oldest original water works – where steam-powered pumps provided the first running water to Kingston residents from 1850. Only six similar preserved water pumping plants remain in North America. A collection of the Earth’s rocks, minerals and fossils (including a dinosaur exihibit), and an overview of the geological history of the Kingston area. The newest exhibit highlights the oldest known animal fossils from Mistaken Point, Newfoundland. The MacLachlan Woodworking Museum holds the most extensive, nationally significant collection of woodworking tools in Canada. The Kingston Association of Museums, Galleries, and Historic Sites, Inc. (KAM) is a not-for-profit, collaborative group of member institutions from the Kingston region. KAM exists primarily to raise public awareness, through the facilitation of collective marketing, promotion, and joint programming initiatives on the behalf of its membership. KAM is also engaged in supporting its membership through the dissemination of information and professional development training related to museum/gallery/historic site function and operation. KAM’s member institutions range from federally owned sites with professional staff, to sites which are member owned and volunteer operated. Some operate seasonally; others are open year round. Many sites have specialist collections which range anywhere from local, to national, to international significance. In addition to built (architectural) heritage, KAM members’ collections include: archaeology, earth sciences, fine art, trade and technology; education, marine, medical, military, and sports history.